Recently Spectre Miniatures released a new vehicles to complement their existing range. So far most of their vehicles have been based on civilian chassis, though with forays such as the “Razor” that the Russians are using and now this new Humvee, perhaps we’ll be seeing more militarised vehicles in future. When picking up some crew figures to fit onto one of my technicals, I wasn’t quite hitting the free shipping fees cost (and well, that £3 for regular shipping could be another figure in my eyes!). So I threw in one of the new Humvees to give it a whirl. The model comes in Spectre’s usual packaging manner for these larger models; tightly held in a few resealable plastic pockets with all the required bits. I’d purchased just the base kit on this order, and the Upgrade Charlie on an earlier one. The base kit goes for £16, with the upgrades ranging from £3 to £4 depending on the number or size of the parts. In total the base vehicle is made from fourteen parts. Not unsubstantial if you’re used to 28mm resin vehicles, which typically have many of the parts moulded on, or scrimp on the details. Spectre’s kit seems to go for more as a trade off between upping the detail available, but also (and what I assume to be most importantly) to offer the greatest deal of modularity possible. With the existing upgrade kits out of the door and more in future, there seems to be a good deal of options for this kit on offer. The base vehicle itself can be put together to represent a Humvee as it would going into the Iraq War. A bare bones cargo vehicle with no armour and minimal functionality. Unfortunately there is no interior on this one, which likely shouldn’t be an issue for the majority of modellers, though does make converting the kit into some of the stripped down special forces variants not possible (though the 1/48th Tamiya kit, and 1/50th Special Artisan Service Miniatures kits should cater for people wanting to make those, hopefully more on them in a future post). So, at a first glance the kit seems substantial enough and more than enough bang for your buck if you’re competent at modelling on your own parts to suit whichever variant you want. Onto the details. Another area which the Spectre team clearly didn’t scrimp on was the smaller details on the kit. Whilst there isn’t the same level as one would find on the 1/35th scale plastic kits (especially with after market parts), this is a wargaming model where most of that is unnecessary. For its role in wargaming however, the details are more than adequate, in fact more so than what one might expect if all you’ve collected before is say Warlord Games 1/56th plastic kits. What surprised me was how the wheels attached. Rather than having them connect directly onto the bottom of the chassis as you find on a lot of kits they instead have their own parts of the suspension which are modelled. Similar to how Special Artisan Service Miniatures do theirs, but in resin rather than pewter unfortunately. This gives the vehicle a more realistic look, as well as potentially allowing players to twist the parts to simulate the wheels turning if you cut the axles right (or even going so far as removing bits and having the vehicle look like its been hit by an IED to work as a terrain piece). The rear tail gate comes as a separate piece which can be lowered should you want to say have it set down for mounting extra fuel tanks ….or stick an Anti-Aircraft mount on the back as we’ve seen in some more modern conflicts in use by irregular forces. 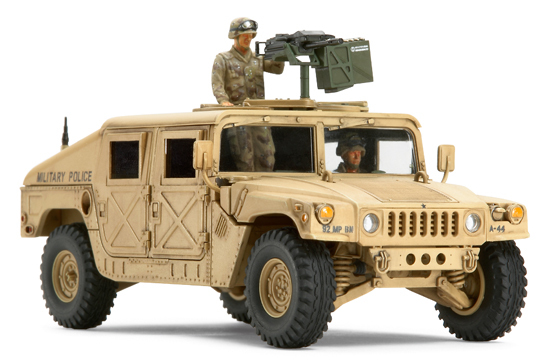 Whilst the cargo bed itself will likely be covered up on most of the variants people choose to build, it comes with a serviceable level of detail to represent these early Humvee variants. It would have been nice to see a row of bolts going along the storage containers either side of the bed, but to be fair many will likely cover this up anyway with loose boxes, etc. As for the wheels, these come with detailing on both sides. The inside of course isn’t as substantial as the outer faces, but unless you’re being creative these likely aren’t going to be seen by most. To be nitpicky. Efforts have been made to emulate the real vehicle’s wheels, though the pattern of the treads look ever so slightly off, and the bolts seem a little short. That is really nitpicky though, and they’re perfectly serviceable as they are (I could so far as to say there’s no “sag” to the rubber, but that’d be entering the realms of your typical 1/35th scale miniatures magazine commentary …they complain about that a lot). Finally, something you don’t see every day the Humvee comes with a set of wing mirrors. I haven’t purchased any of Spectre’s vehicles to date barring this one, so hadn’t really expected to see these coming with the kit. Other resin vehicles which I’ve bought before tend to try and cram on as much as they can onto the base model, and then have a sparring number of additional parts to finish them off – typically meaning that they miss out the wing mirrors. The pair which come in the kit aren’t again seem to be based on the older model of Humvee’s style (and there doesn’t seem to be alternative ones with their upgrade kits representing the newer models), and aren’t overly thick. That may be a concern for some as they may be liable to break with handling, so I’d recommend either having faith in the rigidity of Spectre’s resin …or go ahead and replace these with your own home made parts. Again, I think it right to mention here that their competitor’s kits tend to cast these in metal to prevent these issues. As I said going into this, the level of detail is more than fine for a 1/50th scale vehicle, and Spectre certainly have seemed to have gotten the most out of this resin casting. Things are where you’d expect them to be, and there doesn’t seem to be any overt inaccuracies to my layman’s eyes. Of course, this is speaking about the vehicle which it is intended to represent, and I can’t comment on what should be change when representing one of the more modern variants which Spectre offers upgrades for. In saying that, in the cast I was provided there were some issues which I should go into. Without being all praise for the kit, I think that I should also mention some of the casting issues which were found on my own models. I believe that Spectre has said that they are making these all in house, and have promised that there shouldn’t be any issues in stock (as has happened with their other lines before). Which may explain some of the issues with the kit. Now, before going into any detail here, a key point to note that this isn’t my first Humvee from Spectre. I had sent my first back due to similar casting issues. You can imagine then my concern when a second arrived with similar faults. Its better in many areas, so if they just picked up one off the rack at random then that may indicate an improvement of course. However, I’ve already waited a few weeks by this point, so I’m not in the mood to be waiting for yet another of these and already gave them the chance to provide me with an acceptable product. I’ll fix these issues myself, and whilst the second one isn’t as poor as the first, some of the re-sculpting that would be require may be beyond what people would be willing to do generally. Notably there’s mould stepping on some of the parts (down from nearly every piece with the first order). On the main chassis itself this is less significant, however it seems more obvious on the smaller parts. On this second set the stepping is only on the ends of the axles, which will need to be shaved down to attach the wheels. As will other areas require a sanding to cover up these imperfections before building the kit. For those attaching the upgrade piece this may not be as much of an issue, but if you’re building just the base kit then it could be some unexpected extra work. First cast vs Second. Where the mould stepping is the largest problem though is on the main chassis itself. The step is only minor, but its managed to shift some of the details enough that they’ll have to be sanded down and re-sculpted unfortunately. This is a comparison between the first Humvee received and the second (and unless otherwise stated, all pictures are of the second cast). On the first the stepping is around the front wheel arch and the rear grate. The second one has it in the same areas, but the rear grate’s issue instead is that the detail’s been obscured rather than raised. Similar the rear could do with a bit of sanding near the bottom where its a bit “lumpy”. Again, nowhere near as bad as the first cast (first cast vs second). Speaking of the main hull, I’d commend Spectre on how much flash they removed from the underside of the vehicle. There’s still some clean up to do in place, with one of the wheel arches being a bit uneven, but its not too bad. Now, in this case I’d underline this particular comment by saying that I’m not one to make a fuss about what the underside of a vehicle looks like. Nobody’s going to see that damn area anyway, but it’ll fixed up regardless. I’d note that similarly the wheels have their own marks where they’ve been removed from the sprue. Unless your humvee’s going to be flying up in the air these won’t be noticeable as the vehicle should be sitting firmly on these, and some quick work with a scalpel will clean off most of the leftovers. It does look like these bits of sprues may have interfered with the details on the inside of some of the wheels, but again, that’s an area which nobody is going to be looking at anyway (and its nice that there’s any detail there at all to be honest. Both sets of front head lights have air bubbles around them as well unfortunately (something common to both the first and second casts). Again, first cast vs second. That’s about the extent of the issues I found with the kit. The majority of which seem to be related to how the model was sitting in the mould when it was being cast. Having looked at what available pictures I could find of other’s casts, and my own experiences, they seem to have similar issues with mould slips in one particular area which is a bit concerning. Overall the amount of defects are on a manageable level. There’s going to have to be some rebuilding of details on the main chassis, but the rest is cutting and sanding. Personally, that’s not going to be a major issue. I’ve dealt with much worse kits out there when it comes to these issues, and there’s certainly nowhere near the amount of flash on the vehicle as say Warlord Game’s resin vehicles (at least not that type of flash which could easily have been scraped off for presentation’s sake in a few seconds, so whoever was preparing these for shipping showed some care in that area). Overall its a respectable kit. A decade ago you wouldn’t expect this level of detail and modularity in your modern miniatures. It offers above and beyond of what I would have expected coming from other models made for wargaming purposes, with a good deal of potential for upgrading the vehicle to make some of the variants out there. The defects that it have are on a level which aren’t going to require a whole night’s work of sanding and sculpting to bring it up to par, so I wouldn’t say those hold it back in any way. If you’re looking for something as a start for your own Humvee, this one seems to cover the bases. Could it have had an interior, yes. Will it not having one effect 99% of modellers, probably not. For my own purposes I’ll be scraping off a load of the details and rebuilding the roof anyway, so I’m not too concerned about that sort of thing. Its a basis for building something more, that is if you want don’t want to have this older model of vehicle. In that area I suppose most likely won’t be concerning themselves about little inaccuracies between this and the newer Humvees, and Spectre’s current and future upgrade kits should offer an acceptable range of variants for people to play with. My main concern with my experiences with this kit is that whilst its an improvement over the first (notably with how the smaller parts were cast), the main body still has little issues. They’re for the most part small, but again that’s coming from what I’d be willing to deal with. Where I’m seeing the mould slippage on these Humvees its around the front wheel arch and rear grate on the right hand side. To fix these faults you’d have to sand down the area and rebuild them out of clay or plasticard, which I just don’t see most people doing. If you want to paint this out of the box you’d have to accept that some of the areas aren’t going to look right with the stepping, bubbles etc. Which has me wanting to seek out their direct competition’s kits. Empress’ doesn’t have the same level of modularity as this, and is a bit dated now in terms of the detail and the specific model it represents. I don’t have one of those, but having seen ones owned by others; the Spectre Kit blows it out of the water. So that then brings us to Tamiya’s 1/48th plastic Humvee. That one has the value of being a plastic kit, so has more parts and a higher level of detail, being aimed more at the modelling crowd than wargamers. It also has a few after market kits if you want to make variants such as an Up-Armoured Israeli version. However, being 1/48th its a bit larger than the 1/50th lineup (specifically crew) and incompatible with Spectre’s upgrades. If you’re looking to make some obscure conversion that’s perhaps the kit to buy. Last, without going into 1/56th and “Heroic” scale Humvees (like Crooked Dice’s), there’s Special Artizan Service Miniature’s Humvees. They’re currently making a Special Forces variant with an interior, with a second in a potential series of Humvees which resembles Spectre’s setup. SASM have had there original one for a while now, and I haven’t as of yet gotten a hold of it (as none of the Ukrainian ones really require an interior). Their new one however looks like it could also work for my purposes. Of those alternatives, if you’re looking for a 1/50th scale kit I’d have to say SASM’s comes across as being the best option for Wargamers. I can’t speak for Spectre’s kits generally. I don’t own any of their other vehicles, just their pewter figures. I do however own a couple of SASM’s newer vehicles. This is now two vehicles bought from Spectre which have had casting faults (in the same places too). The type of fault which means I can’t just glue the thing together and paint it out of the box, but will have to spend a while cleaning it up. These aren’t the sort of probles that having bought other resin vehicles in the past I’m unused to. Its just that from what I’ve experience of their competitor, those vehicles just don’t have these issues. If you’re wanting a 1/50th scale Humvee right now which covers these particular variants, then I’d recommend buying Spectre’s kit and dealing with the issues. If you can wait a while though, it may be worth a shot to see what Special Artizan Service Miniatures come out with. From what I’ve seen they’re including the parts which Spectre include as upgrades as part of the base kit, and generally have been charging a similar price to Spectre. It may come down to seeing what each company offers as far as variants go, but my experience so far indicates that SASM’s been more consistent with their quality control. Hopefully I’ll be able to start working on my own conversion of this vehicle sooner rather than later, which I’ll try and liberally post about here and elsewhere.Till next time guys!